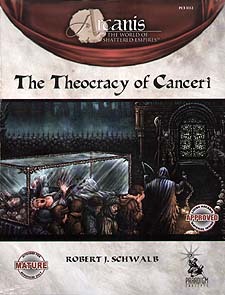 The benighted nation in the north of Onara, Canceri, is a nation of contrasts. Its urbane and cultured priesthood practices the most brutal rites of sacrifice and worship in modern Arcanis. Necropoli stand in perfect repair as the homes of the living decay in ruin. Brutal slavery is the law of the land, yet every soul: priest, noble or common holds the right to ultimate ascension. In all things, wickedness is the norm. Virtue is weakness, and paradise awaits those that embrace their baser nature.